Hex head diameters included: 1.5mm, 2mm, 2.5mm, 3mm, 4mm, 5mm, 6mm, 8mm, 10mm. 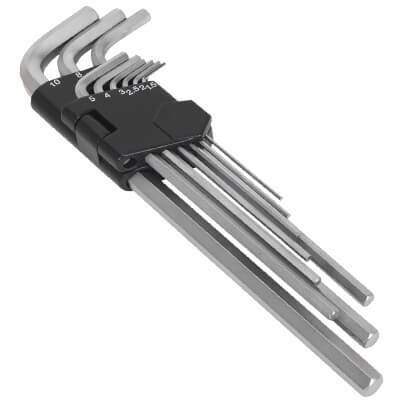 9 piece hex key set designed for use with hex head fittings. Manufactured from heat treated and hardened chrome vanadium steel. Extra long with lengths ranging from 92mm to 230mm for ease of use. Supplied with of diameters ranging from 1.5mm to 10mm. Complete with an easy access case.